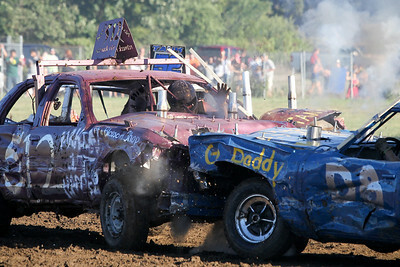 Participants compete in a Demoliton Derby at the McHenry County Fair Sunday, August 5, 2012 in Woodstock. 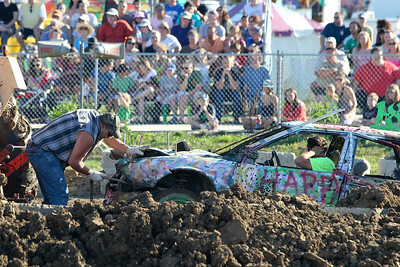 Mike Greene - mgreene@shawmedia.com 512 driver Nate Kestlyn, of Garden Prairie, reacts while being hit by the D8 car during the "Icon" portion of the Demoliton Derby competition at the McHenry County Fair Sunday, August 5, 2012 in Woodstock. Kestlyn took second place in the competition. 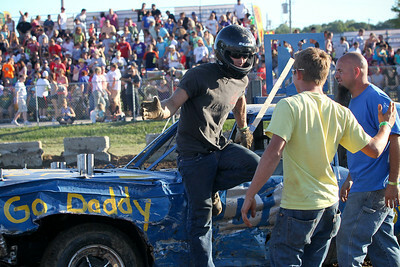 Mike Greene - mgreene@shawmedia.com D8 driver Wes Quick celebrates after winning the "Icon" portion of the Demoliton Derby competition at the McHenry County Fair Sunday, August 5, 2012 in Woodstock. 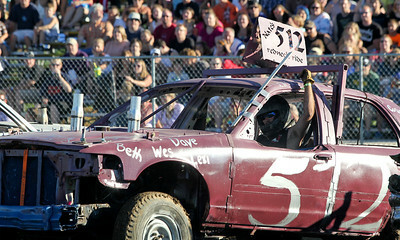 Mike Greene - mgreene@shawmedia.com 512 driver Nate Kestlyn, of Garden Prairie, raises his hand before the start of the "Icon" heat of the Demoliton Derby competition at the McHenry County Fair Sunday, August 5, 2012 in Woodstock. Mike Greene - mgreene@shawmedia.com Ryan Ridge (right), of Woodstock, plays chicken with Joe Bellahavee, of Harvard during the truck heat of the Demoliton Derby competition at the McHenry County Fair Sunday, August 5, 2012 in Woodstock. 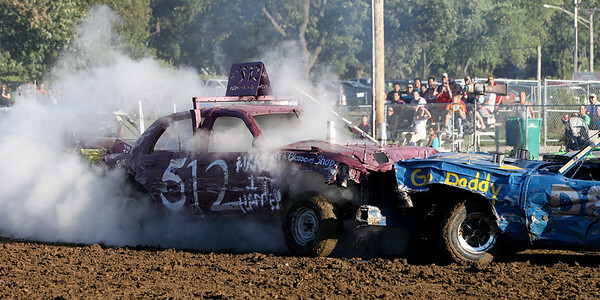 Mike Greene - mgreene@shawmedia.com Car 512 driven by Nate Kestlyn, of Garden Prairie, is enveloped in smoke after being hit during the "Icon" heat of the Demoliton Derby competition at the McHenry County Fair Sunday, August 5, 2012 in Woodstock. Mike Greene - mgreene@shawmedia.com 17 driver Greg Sker, of Marengo, peels down the track during the "Icon" heat of the Demoliton Derby competition at the McHenry County Fair Sunday, August 5, 2012 in Woodstock. 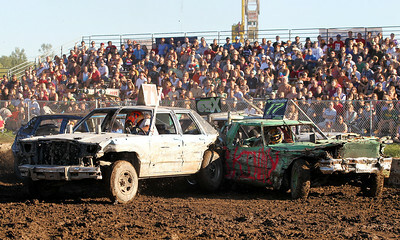 Mike Greene - mgreene@shawmedia.com 71 driver Andy Del, of Burlington WI, is suspended on blocks during the "Icon" heat of the Demoliton Derby competition at the McHenry County Fair Sunday, August 5, 2012 in Woodstock. 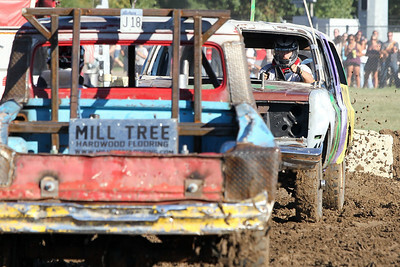 Mike Greene - mgreene@shawmedia.com 71 driver Andy Del, of Burlington WI, backs into 17 driver Greg Sker, of Marengo, during the "Icon" heat of the Demoliton Derby competition at the McHenry County Fair Sunday, August 5, 2012 in Woodstock. 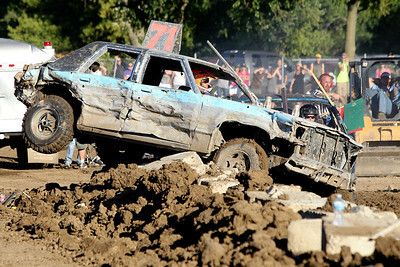 Mike Greene - mgreene@shawmedia.com Crew members haul away the 18 car driven by Scott Redden, of Woodstock, after the compact heat of the the Demoliton Derby competition at the McHenry County Fair Sunday, August 5, 2012 in Woodstock. 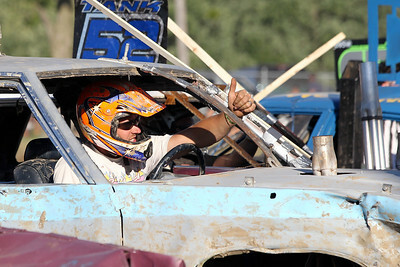 Mike Greene - mgreene@shawmedia.com Andy Del, of Burlington WI, gives the thumbs up before the start of the "Icon" heat of the Demoliton Derby competition at the McHenry County Fair Sunday, August 5, 2012 in Woodstock. 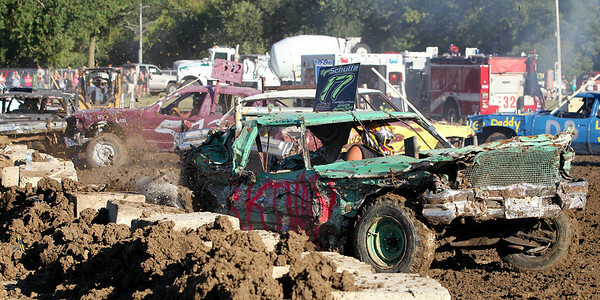 71 driver Andy Del, of Burlington WI, backs into 17 driver Greg Sker, of Marengo, during the "Icon" heat of the Demoliton Derby competition at the McHenry County Fair Sunday, August 5, 2012 in Woodstock.